nesdev.com • View topic - play Gameboy Cartridge on C64 possible? Post subject: play Gameboy Cartridge on C64 possible? iam new to the c64 scene and have a question. the following data i collected makes me think it should be possible. -read SuperGameboy v-ram and recolor it. Do I miss something or is that really possible? Post subject: Re: play Gameboy Cartridge on C64 possible? the Vram of the SGB contains 2BPP data but i dont know if the VIC-II can handel this ? The MCI mode of the C64 should be suitable for this application but that is just my guess. C64 MCI mode generates 320*200 pixel resolution with 4 colors per 8x8 cell. so ... you might have your work cut out for you. 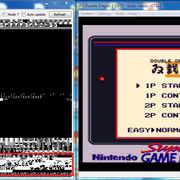 I have no idea how quickly that can be done for the 5760 bytes in the SGB frame buffer. But it would stretch the picture from the SGB pixel aspect ratio 8:7 to the C64 multicolor pixel aspect ratio 3:2, making everything 31% wider. It's much easier to do that in a hardware fashion, really, since you then don't have any AND nor ORing, just a matter of what's being written or read. I know of a relevant patent. Consider the "prior art" description. The NTSC simulation doesn't look any worse than 4:3 content stretched to 16:9, something I see a lot of people doing (makes me cringe a bit, but it doesn't seem like a big deal to many people). If that's the price to pay for doing something cool like playing games for one retro machine on another retro machine, I think it's fine. The NTSC simulation doesn't look any worse than 4:3 content stretched to 16:9, something I see a lot of people doing (makes me cringe a bit, but it doesn't seem like a big deal to many people). Agreed. How many youtube videos about retro games have them incorrectly converted to 16:9 format ? Besides, does the C64 even have 2 shades of gray in the 1st place ? Or would any dark colour and any light colour do the job ? I think a SGB on a C64 would be very cool to see ! The C64 has a (comparatively) whopping 3 shades of grey, plus black and white. Lack of grays isn't a problem, GB video looks good in all kinds of colored gradients.